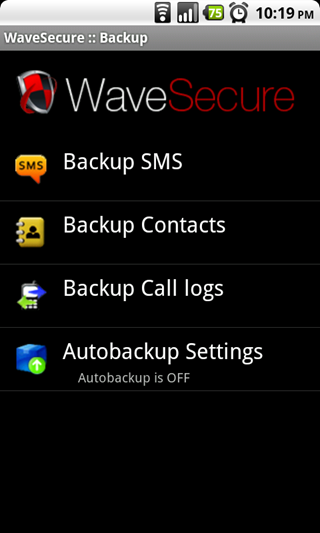 WaveSecure can be found on the Android Market and installed as a 7-day, fully functional trial. But, the nice folks over at tenCube have given us twenty one-year subscriptions, which cost $20 a pop, to give away to our readers. We’ll get to the contest details towards the end of this review - first, we’d like to show you what exactly WaveSecure is capable of, followed by our thoughts. 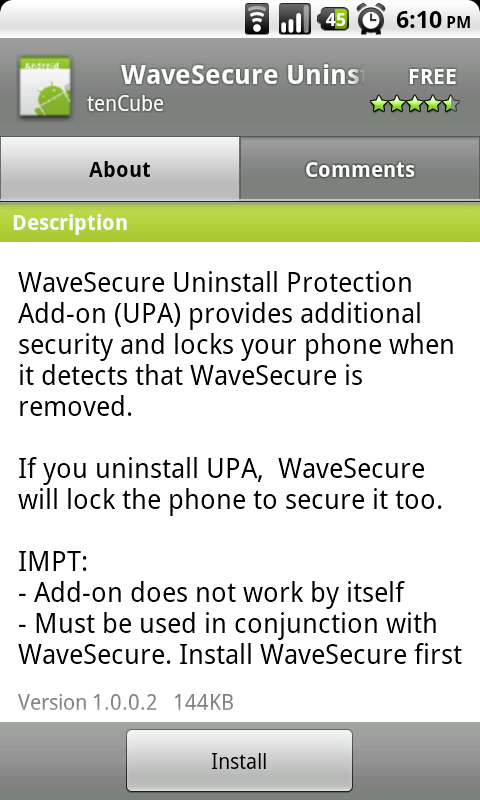 Setting up WaveSecure is surprisingly easy. 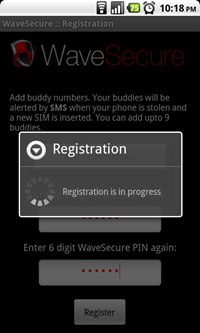 Simply install the app from the Marketplace, launch it, and enter your phone number along with a six digit PIN of your choice, and WaveSecure will register an account for your device. 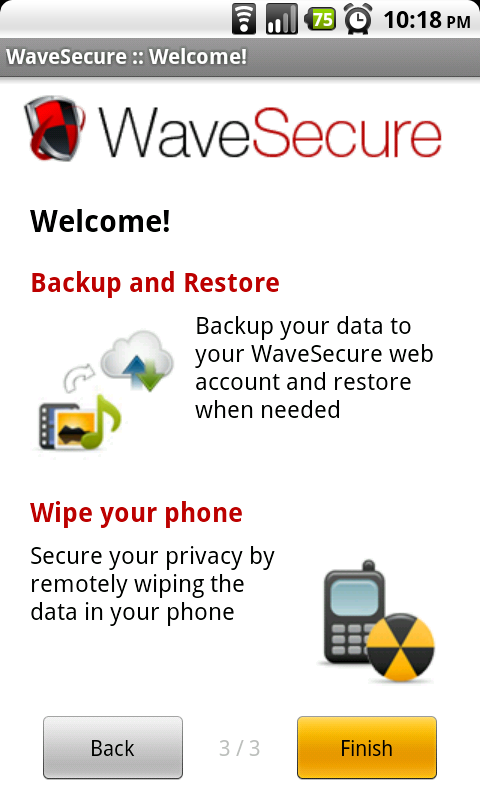 This account can then be accessed and managed (and upgraded to a paid subscription) on WaveSecure’s website. We’ll get into what sort of goodies the web console features a bit later. 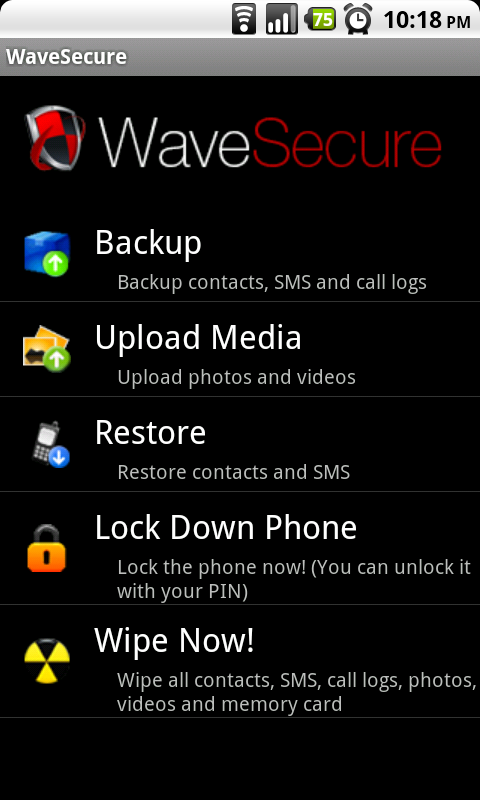 On its first run, Wave secure introduces you briefly to its features, and then takes you to the main menu. 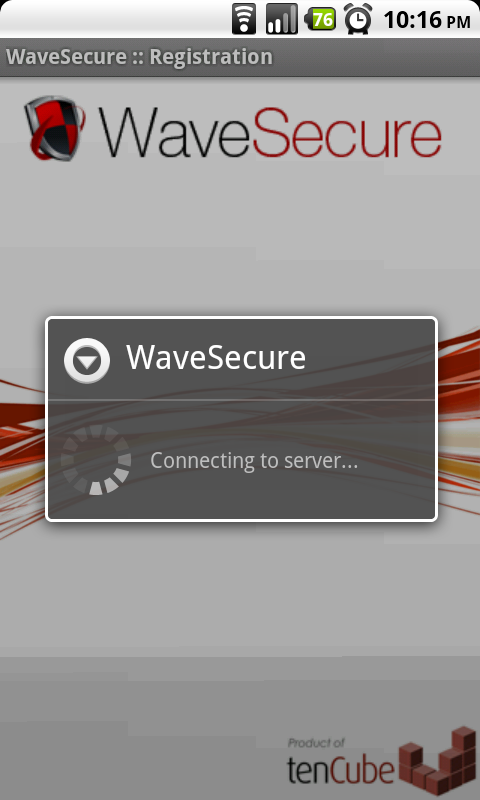 Setting up WaveSecure from this point on is a little less obvious. I recommend quitting the app and restarting it, at which point you will be presented with a list of helpful reminders showing you which features you should enable to ensure WaveSecure works as advertised. You’ll see the first item on the list is Uninstall Protection. 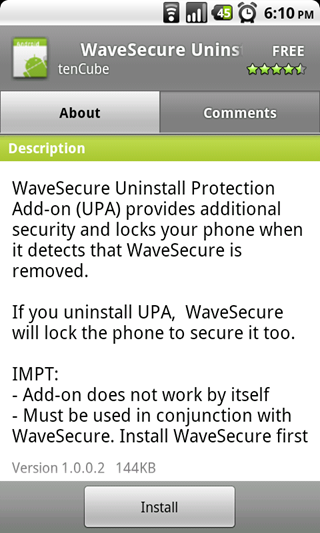 Should a thief be clever enough to try and uninstall WaveSecure after pilfering your phone before you can lock him out, the Uninstall Protection app acts like a fuse; automatically initializing WaveSecure’s “lock” feature if WaveSecure is uninstalled. This same failsafe will engage if the Uninstall Protection app is uninstalled. 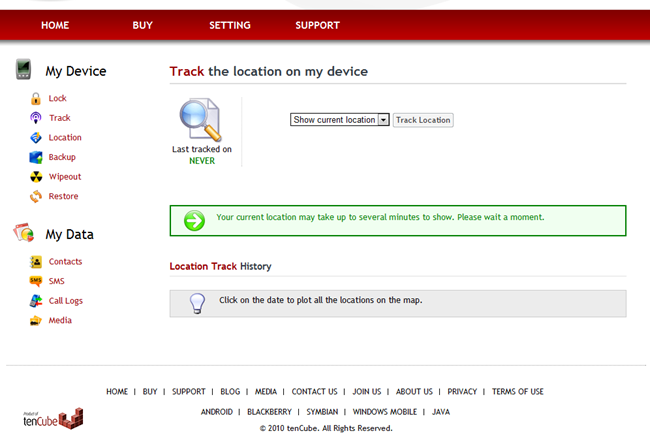 It is a separate application, and can be found in the Market by simply hitting “Install” on the warning as shown above. 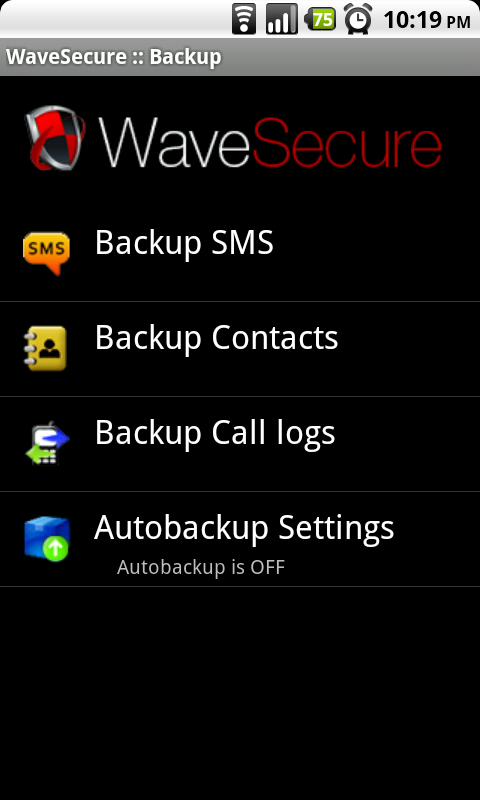 Another WaveSecure feature is automated backup. In reality, its primary function is to track your phone’s call logs and SMS messages, though it can be used to restore your phone’s contacts, call logs, SMS/MMS messages, and manually uploaded media (music, pictures, videos) should they somehow be deleted. 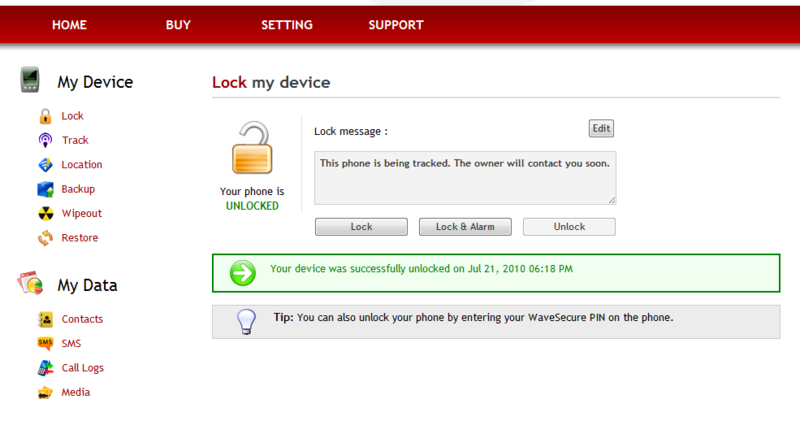 In order to fully “lock down” your phone in the event you engage the lock, WaveSecure benefits from being listed as a “Device Administrator” on the Android OS. 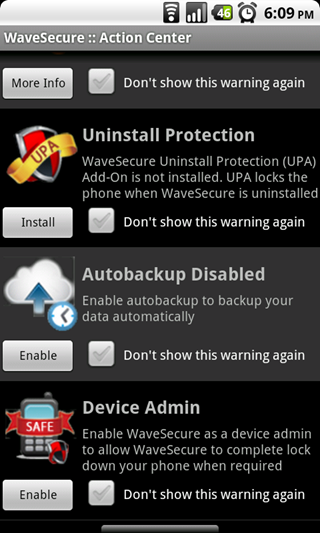 What this means is that WaveSecure is given permissions (shown below) that allow it to control your phone at a low level (not root level, though), basically handing it control over some of the more serious functions on your phone. This shouldn’t be cause for too much alarm, though. 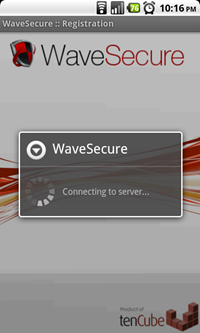 When using WaveSecure, one gets the sense that is a well thought-out, professionally developed piece of software. Given this, along with the robustness of WaveSecure’s web console, I can say that I personally feel safe giving WaveSecure access to my device. So, what’s all this talk about a “web console”? Well, clearly WaveSecure wouldn’t be very useful if you could only utilize its features from inside the Android application, especially if you’re not in possession of your phone. Enter WaveSecure.com. 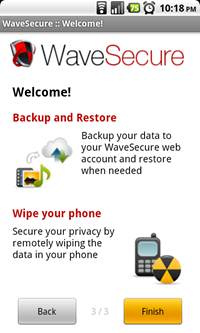 As you can see, WaveSecure’s web console allows you to access even more features than are available on the application installed on your phone. 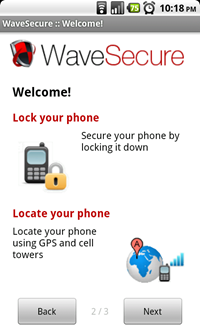 You can remotely lock and unlock your device, track its call logs/sms messages, backup, wipe, or restore data, and query your device’s geographic location. The “Lock & Alarm” function locks your device and endlessly loops the sound of a girl screaming in classic horror-movie fashion, which would probably cause most would-be thieves to put down your phone and walk away. However, by repeatedly mashing the home and volume down buttons, I was eventually able to mute the alarm on my locked device (guess that’s a bug). 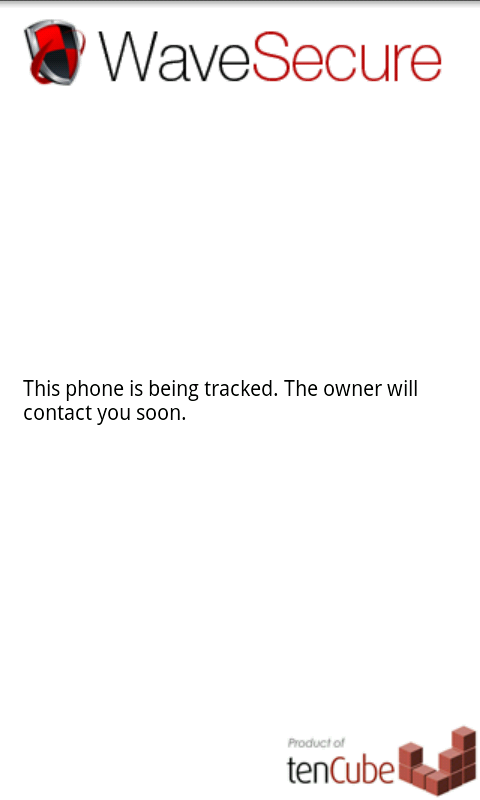 The WaveSecure lock screen sends a message of your choosing (this is the default) to your phone when activated, and can give return instructions or display shameless insults (or both) to would-be phone snatchers. 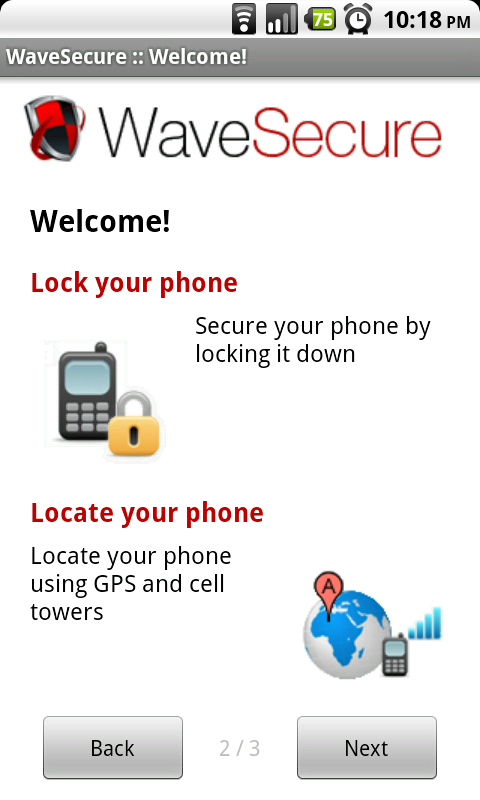 Should you accidentally lock your phone, it can be unlocked by a press of the menu button and entering your PIN. So, what if you forget your pin? 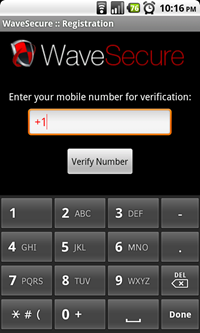 WaveSecure allows you to retrieve it via 2 methods, and one must be configured if WaveSecure is to be of any use to you in the event your phone is stolen. The first is via e-mail, by hitting the menu button in the WaveSecure app and going to Settings-> User Settings you can set an email address where a temporary pin can be sent. A temporary PIN will be sent to your e-mail if, on www.wavesecure.com you select “I forgot my PIN.” The e-mail option cannot actually be triggered on the phone. 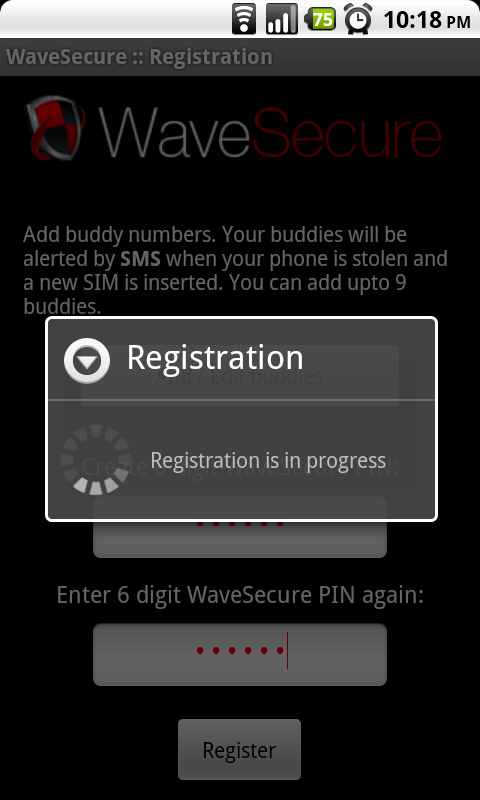 The second is via text message, and should you forget your pin immediately after making it, WaveSecure puts your own phone number in its SMS “buddy list” by default when it installs. 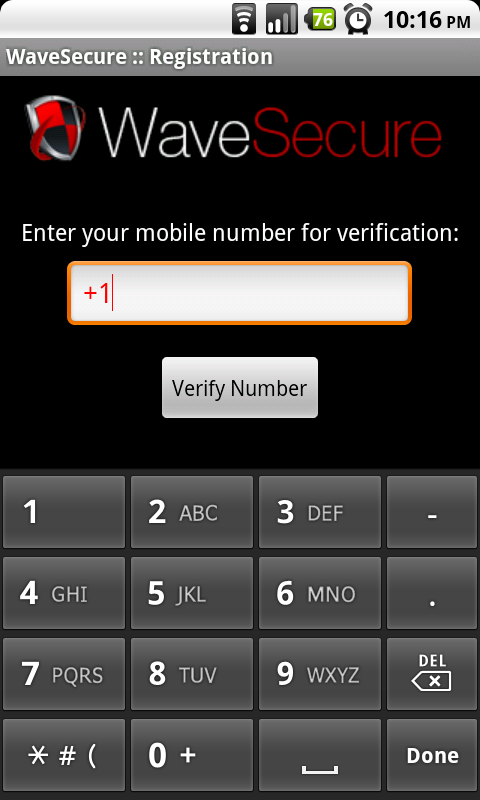 Thus, removing your number from the list should be your first step after installing, keeping it at the default makes WaveSecure pretty easy to circumvent for even a mildly tech-savvy crook. Update: I’ve been informed this is no longer the case. When I installed the app, this behavior was still in place. 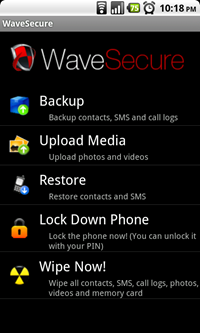 WaveSecure is easily the most customizable, powerful, and feature-rich phone recovery application on the market for Android. While $20 a year may seem hefty at first glance, think of it as a few bucks a month to ensure your phone (and the information on it) can be made useless to most anyone who would swipe it. Today we are giving away 20x 1-year subscriptions to WaveSecure, worth $20 each, sponsored by the folks behind WaveSecure itself. If your name is listed below and you haven't gotten your prize yet, please email [email protected] to claim it (mention your name or twitter handle in the email). All claims will be verified. Those of you who didn't win can still get a 20% discount until the end of August by using an exclusive code POLICE here. Note: Since Facebook will not allow us to send this many individual messages without banning us first (no thanks), we have no other means of posting the winners other than by making a comment on Facebook in hopes that they will notice it. both, to double your chances of winning. Method 2. 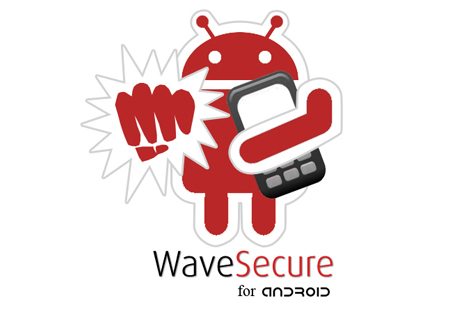 Like/fan the AndroidPolice and WaveSecure Facebook fan pages, then Like 2 Facebook entries: 1 for this article and 1 for any another AndroidPolice article of your choice. The contest starts immediately and runs until Monday, August 2nd, 11:59PM PST. Winners will be announced here and notified by twitter, Facebook, or email. Good luck everyone, and feel free to share the top reason for why you need WaveSecure in the comments.